Senate Bill 407 is a first step toward a new system of bail in Georgia, being tried with little success in other states, that is designed to tug on the heartstrings of Georgians. The misinformation campaign is designed so Georgians think that the jails are full of poor people on their first offense who cannot afford bail. Instead, the reality is that most persons who are stuck in jail are there for other reasons. For some, it is for the simple fact that they have committed crimes over and over, and over, and over again and when they do, they never show up for court. Judges – having already exercised their discretion by giving those charged the opportunity to abide by free release, only to see those defendants not appear – get tired of the revolving door and require them to post a bond or stay in jail pending trial. By requiring a bond, it forces these defendants to enlist the help of family and friends to foster their release – vouching for them and taking the responsibility to assure their appearance. In turn, this allows for those victimized to also have their day in court. 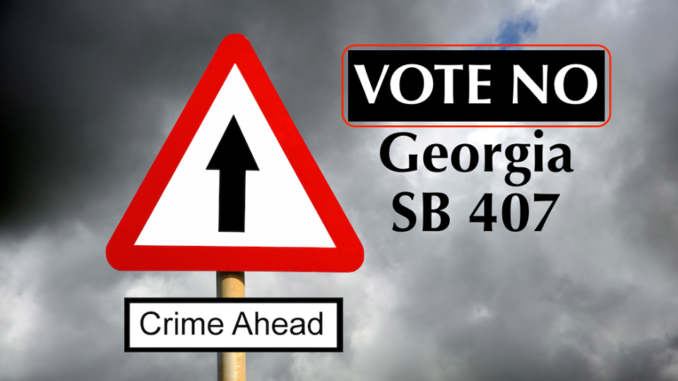 Senate Bill 407 is a measure that will weaken Georgia’s system of criminal accountability. First, the legislation introduces the concept of unsecured bail bonds into Georgia. Rather than actually having to post bail, an unsecured bond is where a defendant gets to simply “promise” the court that they will post their bail later, i.e., after they skip court. Not only does national research show that unsecured bails do not work any better than a defendant simply promising to show up in court, unsecured bail has another big problem. It turns the State into a bail collection agency, and every defendant who skips court or accidentally misses court into a debtor of the State of Georgia. The City of Philadelphia at one point had $1 billion in outstanding liability that was completely uncollectable. Of course, this opens up the other issue of other sanctions including more jail time for non-payment of such debt. Second, Senate Bill 407 intends to eliminate both arrest and the requirement to post bail in misdemeanor cases. This gives the go-ahead for law enforcement to just issue tickets on misdemeanor cases. It also specifically authorizes for four crimes to be treated like traffic offenses. Possession, distribution or sale of controlled substances. This might not sound like a major problem, but it is. On main street, brick-and-mortar businesses have a hard time competing with on-line competitors as it is. Weakening accountability for those who continue to steal by giving shoplifters and those who defraud retail stores a free pass harms local communities and local business. Criminal trespass can be a domestic factual context crime, but Senate Bill 407 would just tell the officer to issue a ticket – as if it were jaywalking. Controlled substances crimes aren’t always just possession of a dime-bag of marijuana—they can include the possession and distribution of opioid drugs and meth that are currently destroying many communities. Yet, under 407, just punch a ticket. To add insult to injury, Senate Bill 407 delegates power to unaccountable and activist judges to make rules regarding arrests and releases from jail. “The Judicial Council of Georgia” is a 27-member body that will have carte blanche to re-write Georgia’s bail system. In other states, Justices of Supreme Courts have taken this instruction to implement the federal no-money bail system, which is proving a disaster to community safety and costing an arm-and-a-leg in other states. It’s time for the Georgia legislature to SAY NO on their bail reform plan. This is not the time to harm small businesses, weaken criminal accountability, and have cops start issuing tickets to heroin dealers that are wreaking havoc in Georgia’s communities. Click Here or use the link below to Email Legislators with Just Two Clicks and Urge them to VOTE NO on SB 407! I’m tired of seeing criminals with multiple felony charges get to walk free and receive assistance from the state! I paid dearly for a minor traffic incident but yet a drug addict with 8 narcotic pills while on felony probation served 90 days and was released with time served! Paid nothing to the court! It’s time to make real criminals PAY! !